Open Netscape Communicator 4.8. 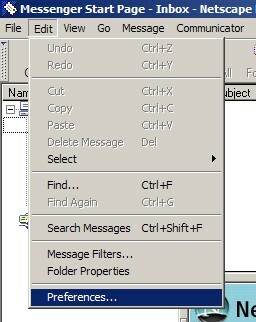 If the Netscape application chooser shows up, click on 'Inbox' like in the first screenshot. If it does not, in the bottom left corner, click the 'Inbox' icon (the one that looks like a letter). This will open up the Netscape Messenger application. Click on the 'Edit' menu and then click 'Preferences...'. 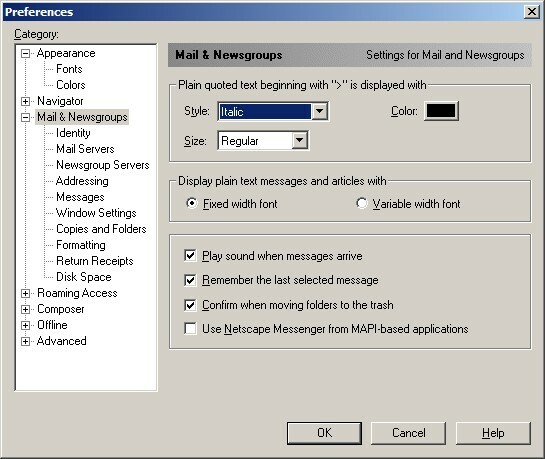 This will bring up Netscape Preferences with the 'Mail & Newsgroups' category highlighted on the left. Click the 'Identity' sub-category on the left. Click on the 'Mail Servers' sub-category on the left. In the 'Incoming Mail Servers' listing, click on your mail server so that it is highlighted and then click the 'Edit...' button. In the general tab, make sure that your settings look like the settings shown in this screenshot. 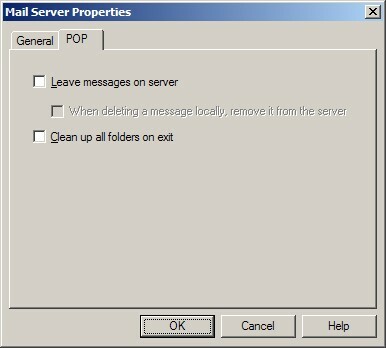 Make sure 'POP3 Server' is selected. Put a checkmark in the box on the left and change the number to '15' minutes. Click the 'POP' tab at the top. Make sure that the box beside 'Leave messages on server' is NOT checked. Click the OK button to get back to the 'Mail Servers' sub-category. The settings for your 'Outgoing mail server' are shown here. Make sure that your settings look like the settings shown in this screenshot. Put the dot in 'Never'. Click 'OK' to return to the Netscape Messenger application and now you should be able to send and receive email.